The University of Notre Dame Press has just announced a new publication that may interest the many followers of Thomas Merton. 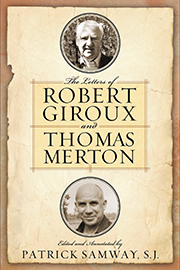 The book is The Letters of Robert Giroux and Thomas Merton, edited and annotated by Patrick Samway, S.J., with a foreword by Jonathan Montaldo. Fr. Samway’s book is the press’s contribution to the 2015 centennial celebration of Thomas Merton’s birth. As editor-in-chief at Harcourt, Brace & Company and then at Farrar, Straus & Giroux, Robert Giroux not only edited twenty-six of Thomas Merton’s books; he also served as an adviser to Merton as he dealt with unexpected problems with his religious superiors at the Abbey of Our Lady of Gethsemani as well as those in France and Italy. Arranged chronologically, the letters in Samway’s volume offer invaluable insights into the publishing process as well as into the friendship between the two men, one forged when they first met as undergraduates at Columbia College in the mid-1930s. Fr. Samway had unparalleled access not only to the materials in the volume but to Giroux’s unpublished talks about Merton which he uses to his advantage in an introduction that interweaves the stories of both men with a chronicle of their personal and collaborative relationship. The result is a rich and rewarding volume which shows how Giroux helped Merton to become one of the greatest spiritual writers of the twentieth century. To learn more about the book and to order, you can visit the University of Notre Dame’s site at http://undpress.nd.edu/books/P03190.